There are so many obvious advantages of owning a hardwood floor it is almost an aesthetic crime not to restore it to optimum beauty! While a successful wood floor renovation can be carried out by an enthusiastic DIY-er with a basic knowledge of joinery, you may instead opt to call in a specialist wood floor renovation company for a complimentary quotation. This has the additional benefit of allowing you to gain insight into the current condition of the floor, which may not otherwise be apparent. There are few things in the home more beautiful, or more desirable, than a well renovated wood floor. If you would like to see your natural hardwood flooring returned to pristine good looks and shine under your own hand then follow the following process carefully and completely for best results. 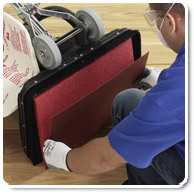 Alternatively, ask your floor renovation professionals for a quick and easy quotation. All wood floor renovations begin with eliminating flaws and securing loose boards. This involves a careful inspection of the floor, paying particular attention to areas which have concealed pipework installed after the floor was laid, as there is a chance those areas will have boards which have worked loose over time. If you spot a board that is badly damaged then you will need to replace it before continuing with the renovation. Another common flaw is spaces between the planks, which must be filled using wood filler, papier mache or epoxy resin. When the floor is as free from flaw as you can make it, sweep and vacuum thoroughly before the first sanding. Successful sanding depends largely on the type of sander used so choose an industrial sander which you can walk across the boards. Whilst you will have to hand sand those awkward and difficult to reach areas, a drum or belt sander will save time, backache and deliver a smoother finish than hand sanding. The initial sanding will take the rough from the floor so fit the machine with the coarsest grain of sandpaper. Carefully walk the machine at a steady pace along the planks and never leave it stationary whilst the sander is in operation. If you are using a drum sander remember that the drum should be off the floor before starting and stopping the machine. Subsequent sandings can be carried out using a finer grain of paper each time. After every sanding sweep and vacuum the floor and when you have completed the final sanding then apply a solution of white spirit with a lint-free cloth and allow to completely dry before moving on with the floor renovation process. When the floor is totally dry have a final inspection to make sure it is perfectly smooth and even before applying the finishing veneer. If you are using varnish this can best be applied by using floor pads. Simply dip the pad into the varnish (avoid dripping) and apply in small areas at one end of the room. Make sure you begin furthest away from the door. Work carefully and methodically, moving the pad along the length of the wood grain, never against. The floor will normally take at least two, possibly three, coats of varnish. Although the floor will appear to be dry after an hour or so, it is best to leave six hours between coats as certain areas may remain tacky for longer periods of time. For an ultra-smooth finish you can, using the finest grade of paper, sand the floor between varnish coats. When the final coat has been applied leave the room for 24-hours before returning furniture and fitments. A well renovated floor requires only light maintenance to retain its sleek good looks.